The Department of Motor Vehicles is cracking down on people abusing disabled person parking placards. DMV crews on Wednesday searched for violators in downtown San Jose. Several motorists had their placards seized during the crackdown. A San Jose State University student was one of the motorists cited Wednesday. 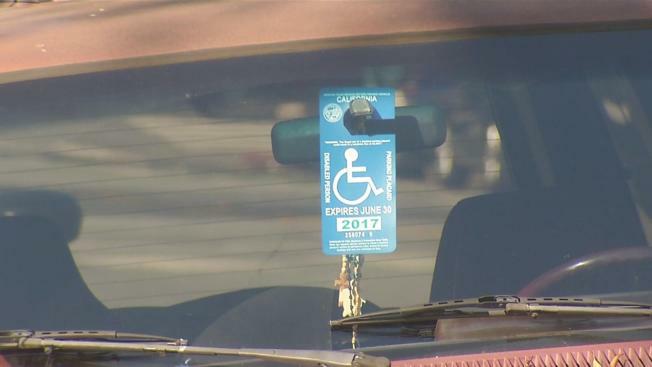 Investigators claim he used a placard registered to his father to park in a handicap spot. The student's father was not in the vehicle. Investigators seized the placard and the student could face a fine ranging from $250 to $1,000. The student said he did not realize his father had to be present when using the placard. "The reality is ignorance of a law does not excuse breaking the law," said Wendy Espinoza, a DMV investigator. Espinoza said the DMV has done 270 similar operations. "Those are our documents and we need to make sure they are used correctly," Espinoza said. The enforcement effort comes at the same time a state auditor criticized the DMV for not making sure the people issued the placards should actually have them. The audit found the agency has not canceled tens of thousands of permits issued to people who have died. Auditors also looked at a sample of 96 placards applications and found 70 that did not provide enough medical information to demonstrate the applicant qualified. DMV issued a response Wednesday saying it is working to implement 15 recommendations made by the state auditor, including collaborating with medical boards, additional training for staff and adding options for the public to report placard abuse. During the last fiscal year, DMV investigators issued 738 citations for placard violations in California.